‘ello lovelies!! 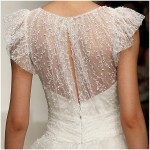 It seems the whole wedding world is going la, la for lace right now, and why not?! 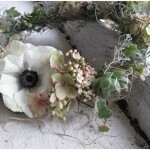 It’s such a pretty thing to decorate and embellish your wedding with. 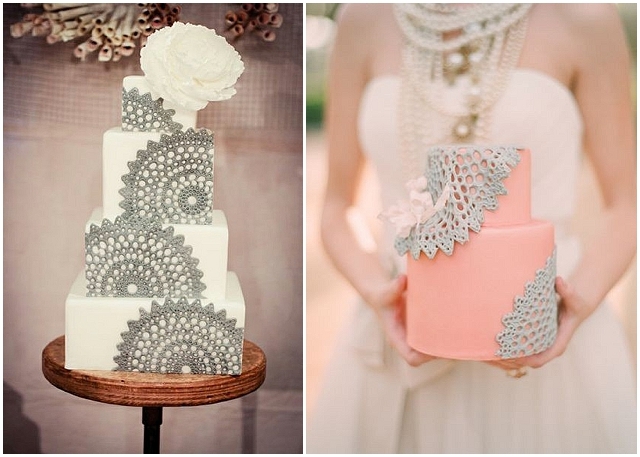 To take the lace look one step further and more towards a homemade vintage theme and feel, we have DOILIES. Yes, doilies. Crotchet or paper. Used as centrepieces, labels or bunting or maybe even doily inspired wedding dresses and stationery… I think this is one look you’re definitely going to love! 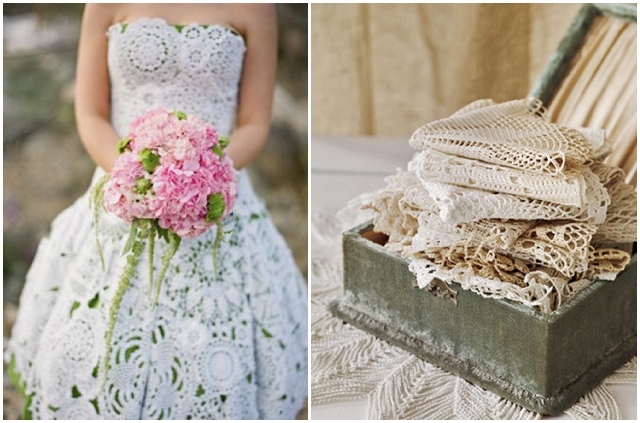 The bride seen below, ACTUALLY made her own wedding dress using a vintage pattern and doilies… wow wow WOW!! Start collecting your vintage doilies by scouring places such as ebay and etsy. There’s no reason why you can’t modernise your doily inspired wedding stationery, I love this ombre stationery. 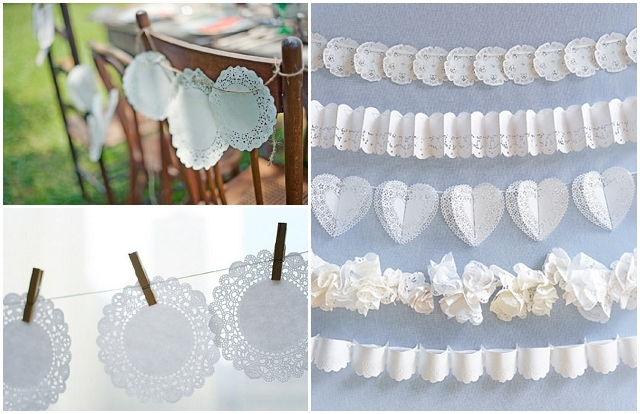 Paper doilies are pretty cool too, use them to make garlands, decorate the backs of chairs or attach to washing lines. Genius! 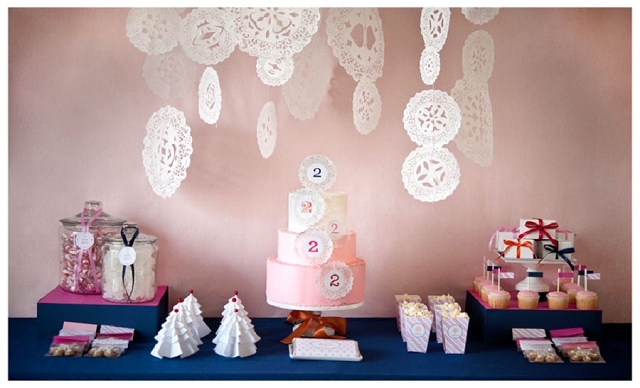 Paper doilies can also be dyed in an array of pretty colours. Use the old teabag or coffee trick to obtain a more vintage-y feel. 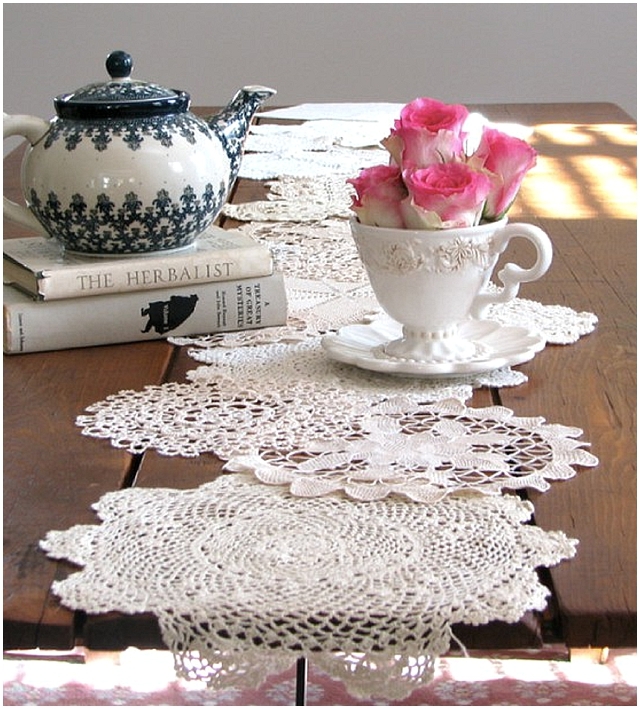 Here you can find a fab doily runner tutorial by Martha Stewart. 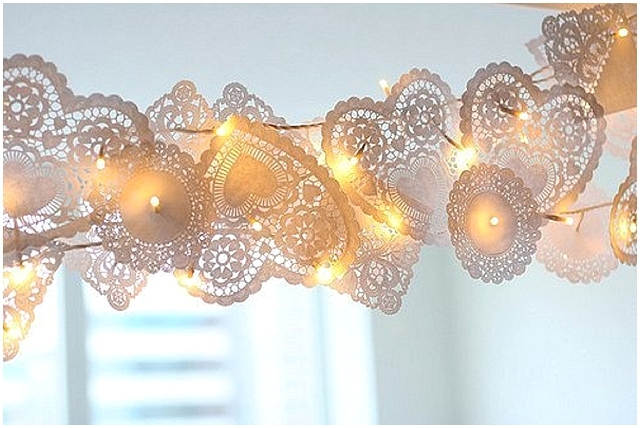 Or how about transforming a humble string of fairy lights into a lit-up doily hearted garland? LOVE. 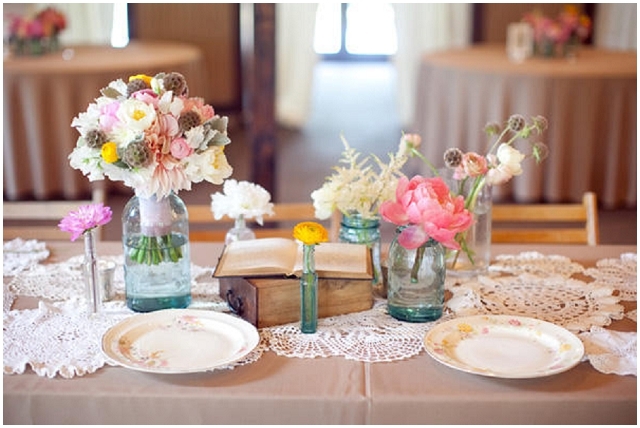 I hope you love this inspiration and plan to use doilies for your wedding decor! 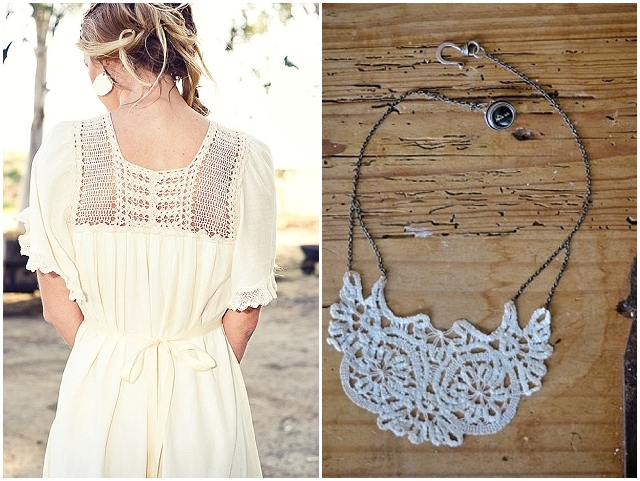 Check out these boho lace wedding dresses too, perfect for your doily wedding theme. 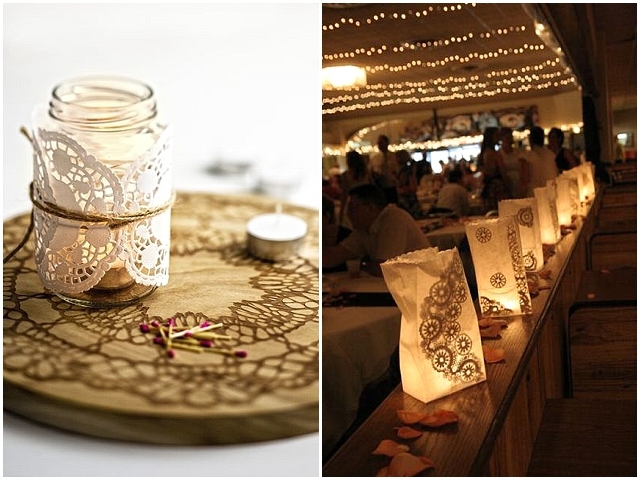 Lovely doily style ideas.. never thought doily can bring different style in the wedding.